Bashkir State Medical University has been licensed by the Ministry of Education of Russian Federation to train international students. Bashkir State Medical University – one of the leading medical universities in Russia, has strong 10th ranked among them. Today this University is a big scientific establishment where fundamental, applied and methodical scientific researchers are carried out. In the unity of scientific, educational and therapeutic processes seen today and the future of Bashkir State Medical University, and it is hoped that the staff of their university to cope with the tasks of training and re-training of highly qualified medical personnel in the modern world. The Bashkir State Medical University collaborates with the World Health Organization (WHO), has extensive scientific contacts with many foreign higher educational establishments and University is a member of the World Health Organisation (WHO) and recognized by Medical Council of India (MCI) India, (MMC) Malaysia, GMC UK and o thers many countries. Students from 30 countries of Europe, Asia, Latin America have studied at Bashkir Medical University. Over this period 2500 general practitioners, dentists and peadiatricians have been trained for foreign countries.General Medicine course is taught in English medium of instructions fully for those who are good at English. 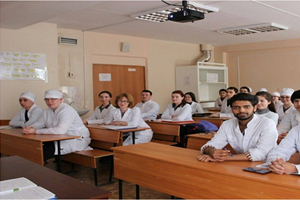 Who have chosen English medium MBBS course don’t have to study the Russian language. They will be admitted directly to the first course where medical subjects are taught in English. Bashkir State Medical University cooperate with many foreign universities, clinics, scientific and educational centres of Germany, China, Norway, USA, Great Britain and other countries. Faculty members and students of BSMU participate in exchange programs, conferences and workshops, perform researches together with our international partners. Ufa city is one the biggest city of Russia. It is the most beautiful city of Russia. This city is situated in south east corner of Europe. Ufa city is also known as Bashkir or Bashkirostan. Bashkir is famous for its natural surroundings. It is also known as another Switzerland. Generally the temprature over here is 20 to 30 degree. During winter the temprature goes down upto -5 C in January. Ufa city has internatinal airport from where direct flights are available for many countries. For local transport Govt. bus, taxi, tram, metro train facility are available. In Ufa city all modern facility are available. This city has the biiggest library of Russia. There are five hostels that can accommodate 2000 students. The hostels are centrally heated like (air-conditioned) and fully furnished. The basic system is two or three students in one room. Students are provided with full bedding. Separate arrangements for boys and girls. Every hostel has internet facilities provided by University. The International students of Bashkir State Medical University have an excellent fortuity to get themselves trained by the qualified and renowned physical coaches. The instructors select the qualified students for further competitions and then they are trained under the surveillance of coaches. The basement of the Sports building (BSMU bld.№10, Teatralnaya str., 2) is comprised of weightlifting gym where the mentors sharpen the skills of the weightlifters and large indoor stadium is established for sports, here you can play and practice basketball, football, volleyball, tennis, table tennis and athletics. The 1st floor of the building is isolated for massage training. The 2nd floor of the building is of Physiotherapy and includes separate wardrobe for girls and boys. The 3rd floor of the building is the department of the trainers and the mat coated hall is for the gymnastic training. Furthermore, the students preoccupy themselves in fitness exercises in the hostels of BSMU. All the hostels possess a huge gym for the students of BSMU and special trainings are provided for kickboxing. The hostel students can train themselves with the well-equipped gym instruments. The International students are given special training on every Sunday. The International students are given proper training to participate in all the tournaments and have achieved a prominent recognition. The Indian students laid a foundation of cricket, they used to play on regular basis and the university gave an opportunity to conduct a cricket tournament amongst the students. 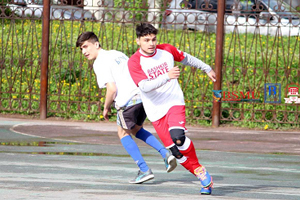 The University provides opportunities in the form of tournaments and championships for the International students to showcase their athletic skills.